Having been back from Xiangxi for more than a month, I haven't had time to sort out the photos, I do not know why. I like to record my life. Why will it drag till present? I wanted to record everything about Zhangjiajie, but I found out that, Zhangjiajie, for me, is a place where camera can not record its beauty, which is good for keeping in mind. The misty clouds picture open, fragrant ink dyeing net dust. Graceful posture Shu state was auspicious, to focus on the beauty of the rivers and mountains. The natural world is so beautiful at this time: around the radiation of the sun was shining everywhere to show off a five color yen, around the beautiful birds flying insects, floating around the intoxicating aroma. Zhangjiajie scenic area is divided into four major blocks: Zhangjiajie national Forest Park, Yang nationality nature reserve, Tianzishan nature reserve, and the four scenic spots of the Yu River Valley nature reserve, collectively referred to as Wulingyuan scenic spots. The topography of Zhangjiajie is known as the Zhangjiajie landform because of its uniqueness. 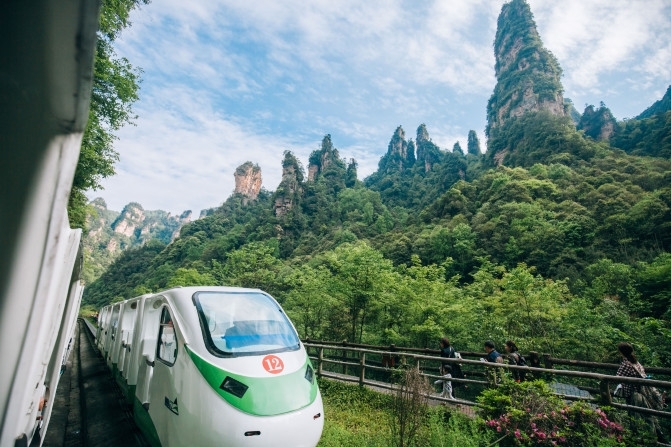 Zhangjiajie scenic area is a bit complicated, it is a general term for all scenic spots, and a wide range of routes, a variety of attractions, such as Yuen jiajie, Zhangjiajie, Yang jiajie, and so on, the scenic area is too large. Day2: Un Hotel En Ville - Forest Park, the first station: jinbianxi - yangjiajie cableway ride to the top of the mountain, see the natural yangjiajie afternoon: the Great Wall, Tianzishan scenic area, will be Taiwan, He Long Park, just look at the most beautiful scenery: the West stone. Scenic area. Day3: Yang jiajie - yuan jiajie - Tianzishan - ten Li Gallery four scenic spots. (ten Li Gallery: take a sightseeing train back and forth) to stay in Wulingyuan. Day4: Grand Canyon - glass bridge tour. Stay in Zhangjiajie downtown at night. Day5: Tianmenshan Mountain - Toast city day tour. 1: On Tianmenshan Mountain, the Grand Canyon glass bridge hold real name system registration for ticket. Do not provide on-site ticket. Yes, you might not buy a ticket to the Grand Glass Bridge in the ticket office. Need to book one day in advance on the website. 2: in the long run, don't trust a cheap tour. 3: do not believe the station soliciting tour guides. 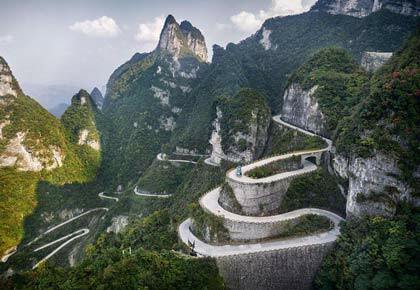 9: Tianmen Mountain Road line is divided into A and B line, cable car up the mountain, the bus down the mountain, B route opposite. Tianmenshan Mountain ticket office (cable car, bus ride) in the urban areas. 10: glass bridge is not allowed to bring cameras into, and if you want to bring similar access, you need to apply in advance. 11: some hotels in Zhangjiajie are not free to provide toiletries. 12: in the Zhangjiajie scenic area, do not take plastic bags and other snacks near the monkey, otherwise the monkey will rob you. 13: don't say you can eat hot food anywhere in Hunan. 14: when visiting Zhangjiajie scenic area, must bring a coat. The hotel I booked is great! 1, the Xiasanguo pots taste great, very authentic. 2, blood tofu, this is my first time to eat this. 3, Zhangjiajie north station, drum skin!!! Strongly recommended, cow is used to do a dish remove the flesh, awesome! 4, The airport shop, is characteristic of suckling pig and dove. 5, Zhangjiajie sausage is my favorite. I bought three bags of sausages at the airport when I left. Zhangjiajie is the best in summer, because the summer high temperature, strong sunshine, if you catch the heavy rain, the opportunity to see the sea of clouds will be much larger than in the spring. I was lucky this time. I came across a rainy day and met a picture like ink and wash.
Discount tickets: 165 yuan + premium 3 yuan (including environmental protection car fares), 24 years of age full-time students can vouchers and identity cards to buy discount tickets. The tickets for the ticket fare system, fingerprint card, fingerprint input into the wicket. Zhangjiajie is Jinbian Xi, Huangshi village, kite village, Yuan Jiajie, Yang Jiajie, Tianzishan scenic, scenic areas and each has many unique attractions, very complex. Speaking of this trip, if you have watched Avatar, catch the demon and Mahatma return, you will certainly be fascinated by the beauty here, because their views are from Zhangjiajie. About Zhangjiajie scenic spot, thousands of tourists have thousands of versions, when you are walking in the forest oxygen bar between this piece of earth out of print, you have been deeply shocked the nature which version of the "extraordinary as if done by the spirits, juejing" is the most correct? I can only say: some scenery, scarce; some gorgeous, is worth us silently; some encounter, worthy of our taste; some romantic, worthy of our pursuit of unbridled. On the way to Forest Park, some monkeys will pick up snacks from tourists. The air quality here is the best in the whole scenic spot. Every cubic centimeter has more than 6-10 negative ions. A foreigner once made a metaphor for the negative ion here. He said it would cost $8 to change a cubic centimeter of negative ions into money. Yangjiajie scenic area east of Zhangjiajie, north of the Tianzi mountain area of thirty-four square kilometers. Yangjiajie incense, Zhi Xi Longquan gorge and 100 monkey Valley three area, the famous landscape Yibudengtian, air corridor, Longquan waterfalls, juebitengwang and crane etc. 200 at the party. The peak of "flying" in the altitude of 1130 meters. Yang jiajie within the territory of ravines, streams, Changqing, dense vegetation, forest coverage rate of 95%. When you climb the mountain, you must take the cableway up the mountain, and the scenery on both sides of the ropeway is beautiful. Yangjiejie, AKA Yang family jie. "As great as the Great Wall.""! Eight years ago, the famous American journalist Simon Winchester in the "New York Times" issued a letter to praise China's Zhangjiajie statement. Then, what is the most beautiful scenery in Zhangjiajie like the the Great Wall? There is only one answer, Yang jiajie. The "peak wall", called "natural the Great Wall", is the landmark of Yang jiajie. Although the landscape of Zhangjiajie is not immortal, it does not have dragon spirit, but it has harmonious scenery. Through the walled top right, the sky wave palace, yangjiajie peak wall landscape General Iron bastions came into view. If the peak forest of Tianzishan is in the prime of life, the peak wall of Yang jiajie is still in its infancy. "Hundreds of millions of years too long, seize the day". 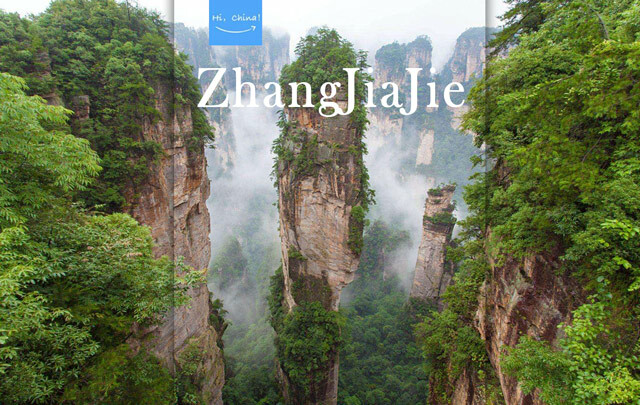 Some people compare Zhangjiajie a gift book, worth reading world character. In my opinion, if you want to read Zhangjiajie, start from the peak wall of Yangjiajie. A rainy day in Zhangjiajie, drizzle cotton like sugar, so cloying; like smoke fog diffuse, strong do not open. Although the rainy day in Zhangjiajie a bit less enthusiastic but more clear, a mysterious fog cloud entangles the shy, more into natural quiet. Tianzishan formerly known as green mountain, Wulingyuan is one of the four major scenic spots. From the Song Dynasty Tujia leaders to mobilize the Kun uprising, claiming to be the "son of heaven", and martyrdom in the name Tianzishan, "forest king" reputation in Zhangjiajie. For travel, it's also like that. The scenery is quite different. "Travel is the right of all, and everyone can choose the right way to travel.". Will make a different step on the same journey." In the eyes of geologists, the mountain is a description of the history book. Yuanjiajie with an average altitude of 1074 meters, and it Jinbian Xi, from the village, village of Huangshi kite bordering the West tianzishan. Zhangjiajie is known as "Qi three thousand, Xiushui eight hundred" reputation, the three thousand peaks, mostly in yuanjiajie. Yuan family of Avatar suspension mountain is to make it well-known at home and abroad. Yuanjiajie name legend originated in Tang period, Huang Chao uprising after the failure of the court to wipe out the mess around the post, for the party. When men have a Huang Chao men, surnamed yuan, in order to avoid the pursuit, came to this world from the deep mountains of Qingyan mountain retreat, he here Jielu as homes, reclamation of grain, and to their own surnames here named, named "yuanjiajie". Wulong Village was above the nest of bandits, cutting in yangjiajie mountains cliffs. In the vast primeval forest, the path leading to the walled but only a truly fulfilled, "Kwan, opens" statement. The mountain stone well-proportioned, although some sad and depressed feeling, laborious, but still enjoy the designer's ideas, fascinating. Most of the visitors climbed to the top of the village, and they were breathless and exhausted. Really admire the bandits, so mind bold chisel on the top of the hill village. Tianzishan Tujia leaders to early Ming Kun call himself "to the king", named after the. The mountain is located in the northwest of Wulingyuan, a total area of 5400 hectares, with the Zhangjiajie national Forest Park, SUOXIYU is the potential of a situation of tripartite confrontation. Kunlun peak 1262.5 meters above sea level, in the mountain view, open view, imposing, rich layers, especially to see and enjoy the sunrise peak, fog, snow products for swan song, "don't swim mountain, to Wulingyuan in vain", "see the mountain, not to see the mountain". The scenery tour line is relatively concentrated, "Pinglan see as far as the king of heaven". Yubi peak is located in the Tianzi Mountain Nature Reserve is one of the best attractions Tianzishan scenic area. Yubi peak is the three Pinnacle tied, or not, the summit long pine, very few like inverted branch brush. This is the story of the emperor to the king's Queen pen ", named peaks. The peak height of 100 meters, the peak number of staggered parallel, cloud fog wrapped around here, Shen seems like floating, "said Qiongshan xiange". Peaks (it is said that during the Ming Dynasty is Tujia people's leader to King's thrown into Yubi mountain, whether you believe it or not, this is only a legend) peaks is recognized as the Wulingyuan sandstone peak forest scenery of the landmark attractions, emerging at home and abroad a variety of media and propaganda, called this world is an inspired passage. The sky wave mansion is a great viewing platform, but you have to climb an almost vertical ladder here. Thankfully, the view here is also worth it! Wulingyuan peak, known as the "three thousand peaks", different shapes, if people, if God, if immortal. Whenever the occasion of the valley amidst the winds of change, rising in the cloud layer upon layer of peaks and knolls. When thick clouds light, everything is like the pinnacle of partly hidden and partly visible, this wonderful weather, thousands of changes. No wonder the floating mountains appear in the "Afanda Avatar" in, to yuanjiajie Qi as the prototype, constructed a planet like the magical world of Pandora. The monkeys in Zhangjiajie are rhesus monkeys. No one has statistics. There are about thirty or forty groups, nearly 3000. 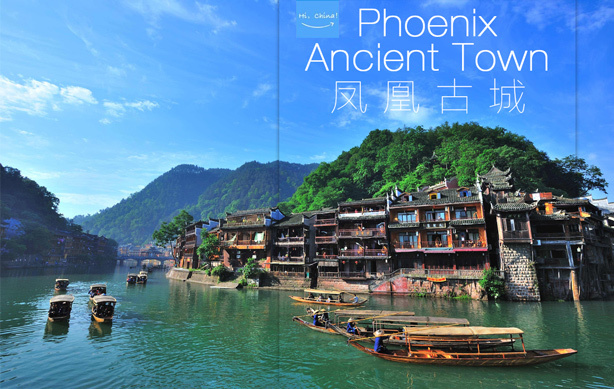 Mainly distributed in Zhangjiajie, Sok River Valley and Tianzishan three major scenic spots. There are no monkeys outside the scenic spots. It seems to be called "link bridge"". Lie between two mountains. Standing on the bridge looking down, only the whole body is soft feeling. The table is a tightly connected with a hanging cross out stone steps. It really did not see before, how many will take "to explore it, and Miao witchcraft. Standing on top of it, just understand, "Taiwan Ecstasy" is taken here jijue scenery, fascinating Chihunduotuo. A sunny day stood looking Shitai, Huangshi village and village into a kidney half curved landscape painting; Jinbian Xi and Yu Gou knife at the foot of the valley, partly hidden and partly visible; clouds clusters of Yanfeng, cloud twines the mist, sometimes diffuse into the Grand River, a river on the peak number of youth "singular picture. One night, thousands of years ago, after rain erosion rock collapse, leaving the top stone arch bridge "the best in all the land". It makes geological wonders formidable, if only the public in Wulingyuan within Diaozao peitian. Tianzishan scenic spots is the most scenic peaks, valleys in dozens of well-proportioned Xiufeng into the clouds, the A new force suddenly rises., like putting Yubi, left the country like a sign off. In the rain of Zhangjiajie, faded the glorious day of the magnificent, more than a little fox charm fairy gas. It stands in the valley of the Gufeng stalagmite, a leader; and the white smoke rising from the bottom, left the world against the background of these peaks, looks like a man, like God, like fairy, people can not help but to the sight more of a sense of awe. In ten the gallery is located in SUOXIYU nature reserve, about five kilometers long, on both sides of verdant trees, wild flowers fragrance; qifengyidan, in different poses and with different expressions, like a huge picture of the landscape, side by side hanging over thousand Maninsan cliffs, the absolutely beautiful natural wonders view into the immortal painting ink danqing. Enter the ten galleries along with rotating attic, welcome, old people, two bell ten main attractions. The air in the whole Forest Park in Zhangjiajie is very fresh. "Ten Li Gallery, little train", the ten Li Gallery is located in the scenic area of SUOXIYU. It is a long narrow canyon and a stream stream. It is the best scenic spot in this scenic spot. The formerly dry creek, also known as Gan Xi Gou, ten Gallery 5 km long canyon on both sides, verdant trees, wild flowers fragrance; qifengyidan, like a huge picture in different poses and with different expressions, landscape painting, side by side hanging over a thousand Ren cliffs, the beautiful natural wonders of melt into immortal division painting ink painting in ten, in the gallery along with rotating attic, welcome, old people, husband and wife Brussels, three sisters and other attractions. It was easier to reach the Ten Li Gallery than I thought. Ten Li Gallery can choose walking or small train. Want to go back and forth ten galleries, it is recommended to take a small train, and then walk out. Because you can listen to the first explanation, make a general understanding. Do not need to take a taxi. It's just a short walking before I arrived at the hotel. A special performance "charming Xiangxi" charm of Xiangxi Grand Theatre in Wulingyuan, located in the beautiful scenery, towering peaks of the Zhangjiajie World Geological Park, Wulingyuan scenic area, simple and elegant, thick atmosphere, complement each other with the natural landscape of Wulingyuan. Zhangjiajie Grand Canyon glass bridge is not allowed to take cameras and backpacks to go in, so I took pictures of the glass bridge on my cell phone. Deep canyon, there is a water ferry. Compared to the ten Gallery, I think the Grand Canyon deserves a great reputation. It is also called "little Jiuzhaigou". The scenery here is really a bit similar with Jiuzhaigou.